Jérôme Gasperi with his mobile application SnapPlanet is this year’s winner of the Space App Camp Barcelona! Jérôme convinced the experts of ESA, SAP, EC and AZO with his innovative service that combines the increasing availability of satellite images with social Networking. The App Camp offers access to the latest space data and the SAP Cloud Platform to European app developers, who work to make the information accessible to a broad audience. As Europe’s Copernicus programme continues to launch the Sentinel satellites – such as Sentinel-2B set for liftoff next week – transforming their data into information to benefit citizens poses both a challenge and an opportunity. The App Camp is an occasion for developers to bring the data from these and other satellites to the everyday user via mobile apps. The SnapPlanet app allows users to choose a location around the world at a given time, ‘snap’ it using images from Earth-observing satellites and share it with their followers. “We know that our satellite data are key for a wide range of applications, but it surprises us every year how the participants come up with new ideas and new ways of integrating our data into these application areas,” said Josef Aschbacher, Director of ESA’s Earth Observation Programmes. The participating teams at the five-day App Camp, held at the Mobile World Congress in Barcelona, had been selected from ESA’s Business Incubation Centres. Each team, composed of two members, demonstrated how satellite and business data can be used to create new business models and solutions in a nearly untapped market. The winning team won €5000 and will be considered for the SAP Start-up Focus programme. As part of its ongoing collaboration with ESA, SAP works with the start-ups from ESA’s Business Incubation Centres across Europe. Other apps developed during the App Camp included Droughtscan miramAPP, which uses Sentinel-2 data to assist water managers who experience problems with dry peat levees during periods of severe drought.SOUL aims to merge data from satellites and vehicle-based instruments to provide air-quality data in near-real time.The Saturnalia app allows users to scan a bottle of wine and displays the best year for that particular wine based on satellite and meteorological data providing soil, atmosphere and weather information The app also recommends wines cultivated in similar conditions.Exploiting Sentinel-1, -2 and -3 data, Earthflow analyses how climate change is impacting agriculture in different regions, and can advise farmers on selecting the most suitable crops while aiding regional governments in implementing better policies for agriculture and water management. 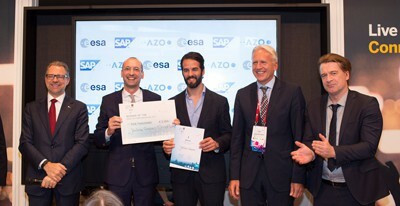 The Space App Camp Barcelona initiated by the European Space Agency – European Space Research Institute (ESA ESRIN), sponsored by SAP, and organised by AZO to support start-ups that make use of the huge amounts of Earth observation data in their products.